Our stay was nothing short of wonderful!! The home exceeded our expectations! We loved the outdoor space and took advantage of the pool whenever we could. The neighbors were so friendly and welcoming. We will definitely be returning!! A wonderful spot for desert relaxation. We have spent two winters here and the Owners are very accommodating. We think of it as our home for the duration of our stay. This was our second time staying at the home and we enjoyed everyday. We you arrive you are treated like you are part of the family. This home is kept in excellent condition you could not ask for a better experience. The day we arrived, we were welcomed like friends by Dave and Steve. They showed us around and instructed us on the pool, electronics, etc. that we would be using while we stayed there. The pictures didn't lie! The house is beautiful with lovely furnishings and wonderfully clean. We really felt at home. very good restaurants within a short driving distance. Of course, there is never a shortage of shopping! A lot of this information has been put into a binder at the house including brochures, business cards, maps, etc. It is a great resource! Everytime we sat outside or just looked out we could enjoy the beautiful view. It was very peaceful and we will be back next year. reccommend this property, this is the best we've every stayed at. Our family spent 2 weeks at the property over Christmas and New Years. The home was even nicer than the pictures and fully equipped. It is a stunning setting with a great pool that our teen daughter and nephew were in constantly. The owners met us at the home for check in and were friendly and most helpful in explaining the property amenities. The community is security gated and very convenient to the main highways to get around the Palm Springs area. We hope to enjoy this beautiful home again. We had such a wonderfully relaxing time on our "staycation" in "Case Del Scorcho":) Actually the weather was wonderful at 90 degrees and the pool was perfect! The backyard pool (with waterfall) and spa were wonderful and that is where we spent most of our time. 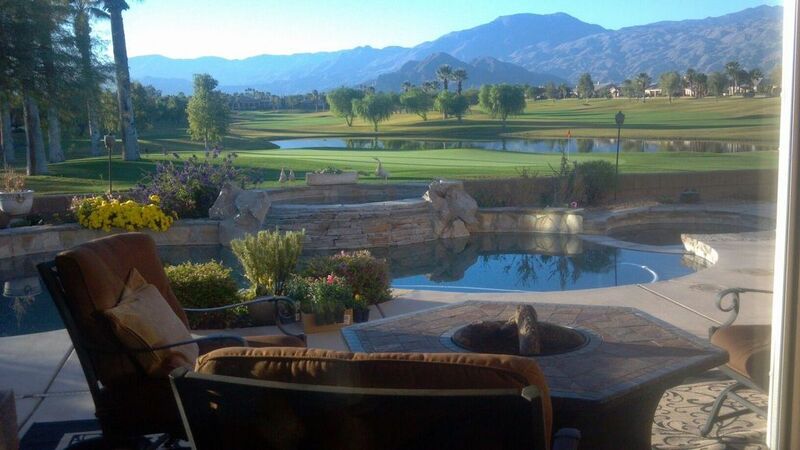 The location and view are absolutely amazing right on the beautifully manicured golf course with pond and gorgeous Santa Rosa mountains surrounding you. The home was lovely with a large open floor plan and high ceilings. It was stocked with everything we needed. We were very confortable during our stay. it litterally felt like our home away from home. Never did we feel overcrowded with our 3 children, including our 2 teenagers friends. Dave, the owner was so kind, patient and accomodating during our stay. I spoke with him several times with various annoying questions;) and each time he impressed me so much with his genuinly kind and patient nature. We truly were not ready to leave after 5 days of being there. Thank you so much Dave and Steve for sharing your beautiful home with us!